could amuse themselves at small parties or gatherings. 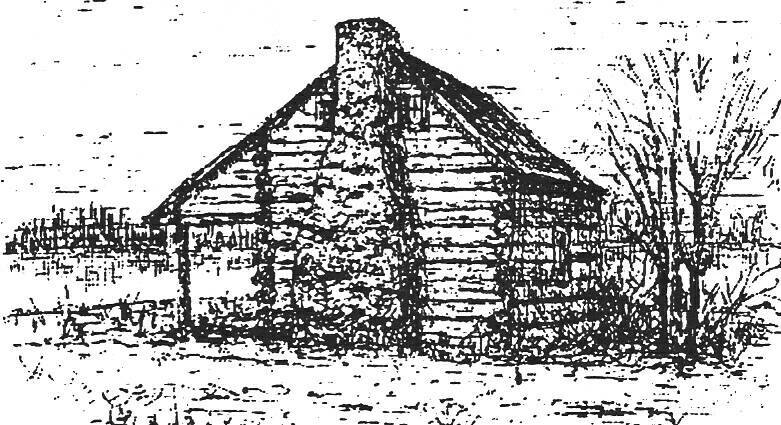 derived from the amusements of New World colonists. 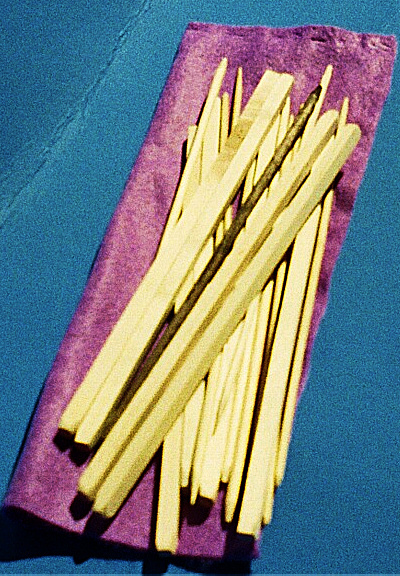 #202 'JACKSTRAWS' PICK-UP-STICKS~ Traditional version of this classic game featuring squared and round sticks in natural wood colors. Includes cloth game bag, history and historical scoring rules. Ours exclusively. 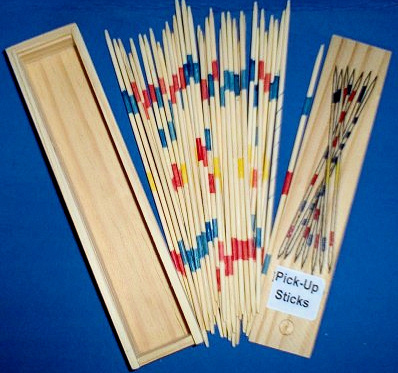 #202-B JR. PICK-UP-STICKS~ Smaller version of the traditional game of Pick-Up-Sticks. 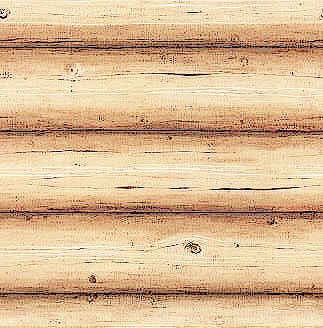 Features colorful bamboo pick-up-sticks, enclosed in a wooden box with a sliding lid. Game rules included. #203 TIC-TAC-TOE~ Traditional 'Tic-Tac-Toe, Three In a Row' game. Played by young and old alike for generations. 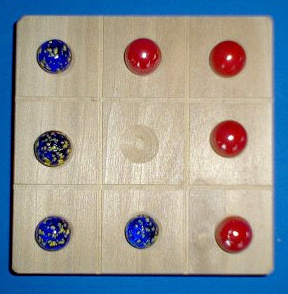 Includes wooden game board, 2 sets of contrasting marbles , history and game rules. 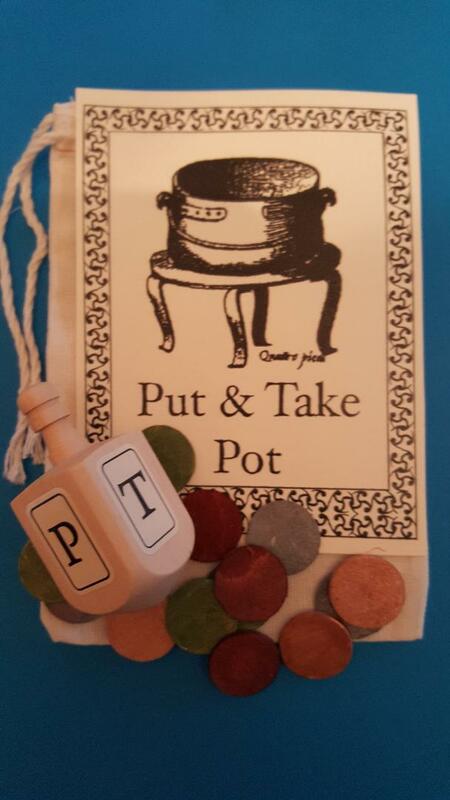 #204 PUT & TAKE~ Historical early American game of chance. Spin the dreidel (top) and play accordingly. 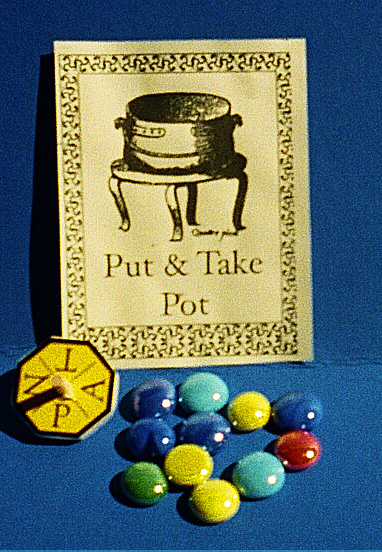 (P=Put a token in the pot; T=Take a token from the pot; N= Take Nothing and A=Take all the tokens from the pot. 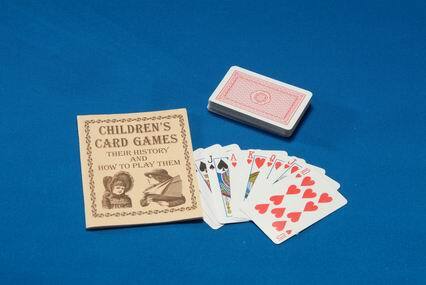 Includes colorful game tokens, dreidel, history , game 'pot' and complete playing instructions. 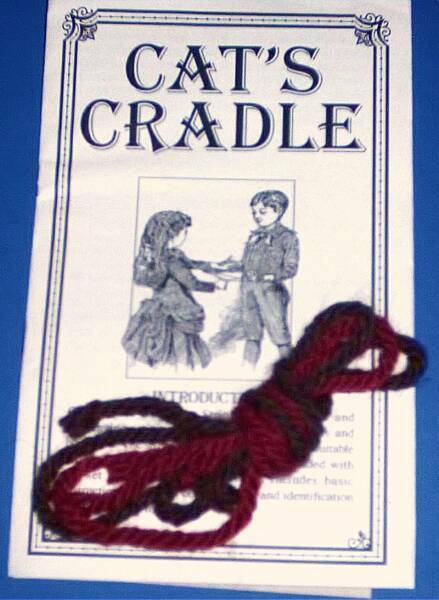 #205 CAT'S CRADLE~ Children have played with this classic toy since the colonial days of America. With our Cat's Cradle set, learn to 'weave' 'Cat's Cradle' and many other familiar string figures. Features jumbo yarn in festive colors and complete directions and illustrations. 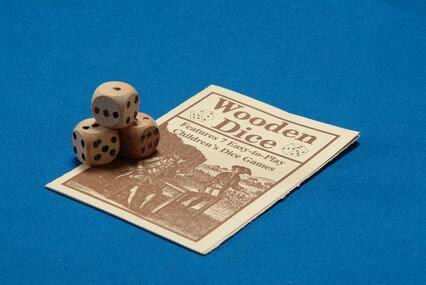 #206 WOODEN DICE~ Traditional wooden dice game package. 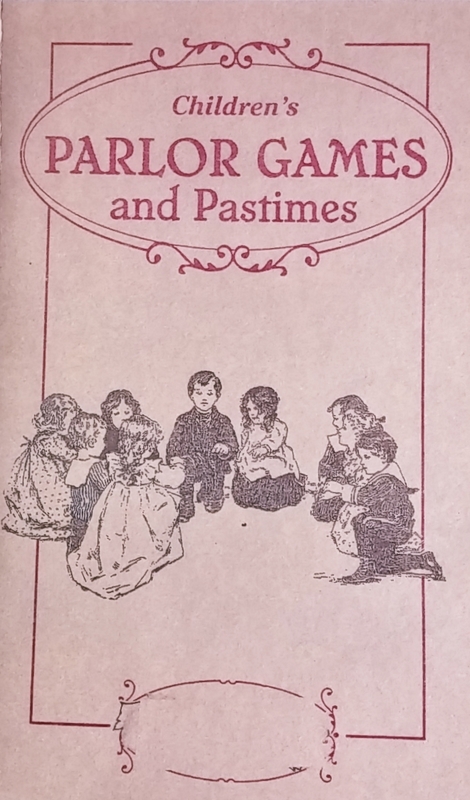 Includes three wooden dice and detailed instructions for seven easy-to-play historical children's dice games. Includes 3 Dice. 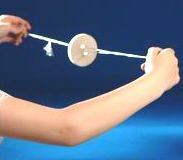 #207 CLASSIC JUGGLING SET~ Juggling is a centuries-old classic game. 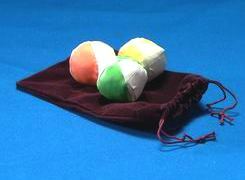 Out beginning juggling set includes three soft-easy-to-catch juggling balls and a cloth carrying bag. Basic juggling instructions included. 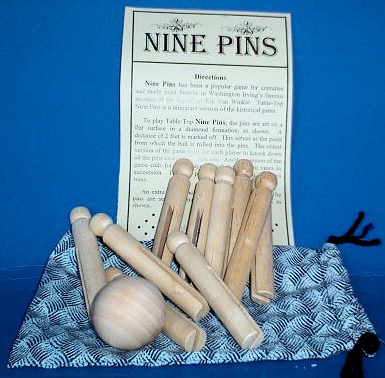 #208 NINE PINS~ Table-top version of this classic, historical folk game. An extra bowling pin in included for playing the more traditional game of Ten-Pins. Includes cloth carrying bag and rules for play. #209 WOODEN DOMINOES~ Complete set of 28 double-six wooden dominoes with traditional playing rules, all contained in a wooden box with a sliding lid. 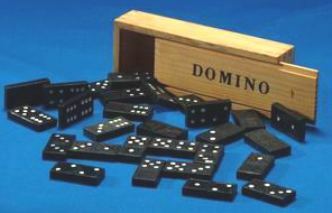 Dominoes have always been an historical favorite game. #210 CHILDREN'S CARD GAME SET~ Our Card Game Set includes our original "Children's Card Games" booklet and a standard deck of cards. 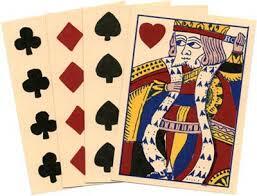 Learn the history and rules of such classic children's games as "Old Maid,", "Crazy Eights" and many more. 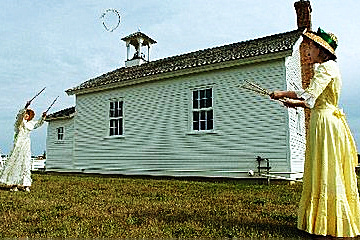 #212 QUOITS~ Table-top version of the classic American folk game, similar in play to horseshoes. 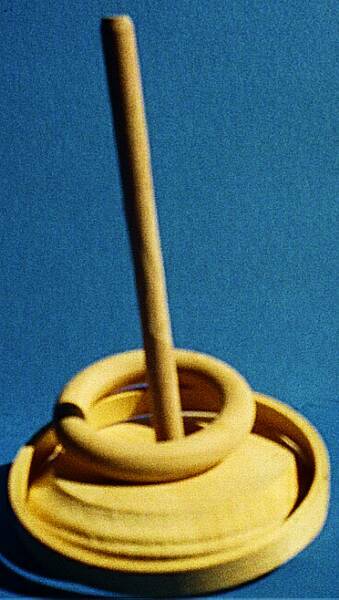 Toss the small and large wooden rings and try to 'ring the hob.' This historical skill game features a 4" 'hob' and includes traditional game rules. 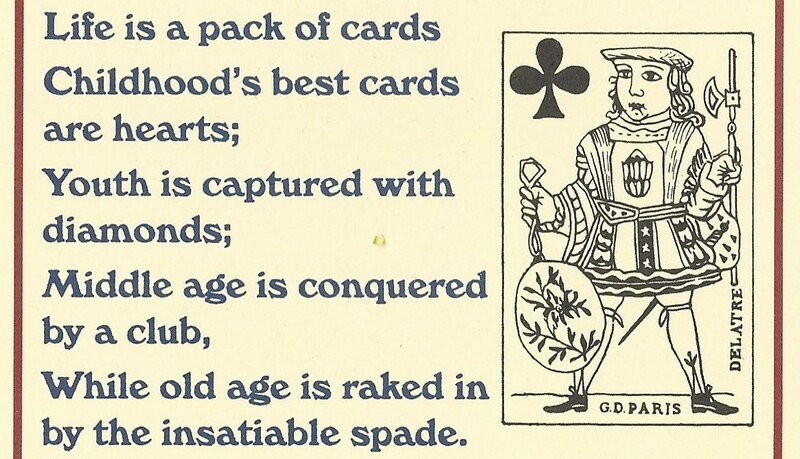 #215H~ Early American Playing Cards~Authentic reproduction of Early American Playing Deck. 52 Cards. 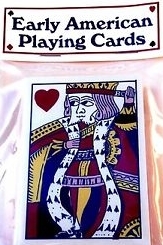 The back of the cards are blank as was common during this time. #204-HD PUT & TAKE (NEW VERSION)~ Traditional Early American game of chance. Includes NEW, larger Driedel, wooden game tokens, game pouch, history and instructions.